New wearable syncs with Galaxy smartphones for notifications. 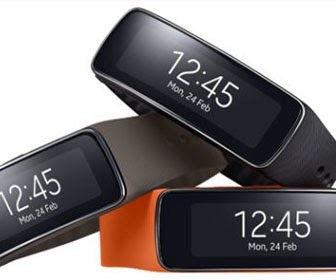 Samsung has added a new entry into the growing fitness wearable market with the new Gear Fit. Like the FitBit and Nike Fuelband, the Gear Fit is worn on the wrist and keeps track of its user's fitness stats, but also delivers notifications from their Galaxy smartphones. The 1.84-inch curved Super AMOLED display features a 432 x 128 resolution, and comes with changeable straps—owners can choose between black, orange, and mucha grey straps. The device is dust and water resistant, and its 210mAh battery is projected to last 3–4 days with typical use, or 5 days with lighter use. When paired with a Galaxy smartphone, the Gear Fit will be able to receive call, email, SMS, and alarm notifications, as well as notifications from third party apps. The 27g wearable is also equipped with an accelerometer and gyro sensors, and a heart rate monitor. "Samsung understands that the next generation of wearable mobile solutions must directly reflect of the diverse interests and needs of consumers," said JK Shin, CEO and President of Samsung Electronics' IT & Mobile Division, in a press release. "In response, our Gear product portfolio continues to expand with unique devices for a wide range of lifestyles, including the new Gear Fit designed to help those consumers striving to live more fit and active lives without sacrificing their own personal style or their ability to stay connected on the go." The Samsung Gear Fit will be available starting April 11th. Pricing has yet to be announced. During the Mobile World Congress, Samsung also unveiled its newest flagship smartphone, the Galaxy S5, and its second generation smartwatches, the Gear 2 and Gear 2 Neo.